Extending its leadership in the enterprise storage market, Oracle announced the StorageTek T10000C tape drive, which provides the highest performance, lowest total cost of ownership at one-third to one-fifth the floor space of any tiered storage, archive or backup solution. Oracle's StorageTek tiered storage solutions incorporate the advantages of both disk and tape, and deliver the most scalable, cost efficient and energy-efficient storage solutions for heterogeneous data protection, consolidation, archiving and cloud environments. 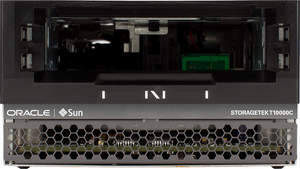 The StorageTek T10000C is the industry's fastest and highest capacity tape drive with a 5TB native capacity and 240MB/second native throughput -- more than 3x the capacity, and 50 to 70 percent faster than any other tape drive, including LTO-5 and the IBM TS1130. Compared to disk-only solutions from EMC, Oracle's StorageTek solution scales to 30x the capacity, and 50x the performance, while requiring 99 percent less power and cooling. The capacity and throughput increase helps customers drastically reduce the cost of enterprise storage, while providing the fastest backup and archive solutions. Oracle's StorageTek tape storage solutions are the first to scale to an exabyte (1000 PB, with 2:1 compression) to handle the world's largest archive and long-term backup requirements. The solutions include in-line encryption which provides the critical data protection that enterprise customers demand while remaining completely transparent to the application and without any performance degradation. With the first exabyte capacity tape system, Oracle stores 17x more data in one tape library unit and provides 5x more performance than IBM, and more than 30x the capacity and 50x the performance of EMC's disk solutions. For open systems archives, Oracle's Sun Storage Archive Manager software provides simple, policy-based management of data across disk and tape tiers. Paired with the Oracle Exadata Database Machine, the StorageTek T10000C shortens the backup window by 33 percent. For open systems backup, Oracle's StorageTek tape drives are qualified with Oracle Secure Backup software, as well as with industry-leading backup software as part of a disk-to-disk-to-tape (D-D-T) architecture. For mainframe environments, the StorageTek T10000C is fully supported by Oracle's StorageTek Virtual Storage Manager, which provides the unique capability of policy-based management across Fibre Channel disk, SAS disk, fast access tape, and high capacity tape. The StorageTek T10000C tape drive extends Oracle's leadership in providing an integrated data protection solution with Oracle 11g Recovery Manager, Oracle Secure Backup and Oracle's Sun Storage Archive Manager software running with Oracle Solaris and Oracle Linux, and Oracle Exadata Database Machine, Oracle's Sun SPARC Enterprise Servers, Oracle's Sun Fire x86 clustered systems and Oracle's Sun Storage and Oracle's StorageTek Tape. The new tape drive also runs with leading third-party operating systems, open systems storage management products and mainframe storage management software. "The release of the StorageTek T10000C tape drive reaffirms Oracle's undisputed leadership in tape technology," said James Cates, vice president, Hardware Development, Oracle. "The StorageTek T10000C sets the new standard in tape by storing over three times more data on a single cartridge than any other tape drive. Combining it with the StorageTek SL3000 and SL8500 libraries helps ensure that customers, regardless of size, can afford to retain critical data without concern for future scalability." "Enterprise customers continue to grapple with unabated data growth, extremely long retention periods, short backup windows, as well as budget and floor space constraints," said Robert Amatruda, Director, Data Protection and Recovery, IDC. "The StorageTek T10000C tape drive, coupled with the StorageTek SL8500 and SL3000 enterprise libraries, addresses customer requirements for high-capacity and cost-effective tape solutions enabling them greater efficiency for their backup, archive and recovery needs. Additionally, The StorageTek T10000C tape drive demonstrates Oracle's commitment to future innovations in its tape technology." Oracle (NASDAQ: ORCL) is the world's most complete, open, and integrated business software and hardware systems company. For more information about Oracle, please visit our Web site at http://www.oracle.com.